A reliable Raspberry Macarons Recipe, with Chocolate Raspberry Filling, is the perfect Valentine's Day (or Galentine's Day) treat. In addition to this recipe, which has proven to be very successful for me, I am sharing my 14 tips for successful macarons and showing the steps in a video. So, out of curiosity, I just googled the origins of Valentine's Day and this just may surprise you. It seems that there was a Roman priest in the 3rd century AD by the name of Valentine. In a nutshell, he was imprisoned for illegally conducting marriage ceremonies for soldiers…it seems that Emperor Claudius II felt that married soldiers weren't quite as effective as single soldiers and so had outlawed married soldiers. But there's more…while imprisoned he fell in love with his jailer's daughter. On the day he was executed, February 14, he sent a note to her signed ‘Valentine'. And bam…St. Valentine's Day, celebrated on February 14, was born. So…puts a little different twist on this day to celebrate love and lovers, doesn't it? In any event, given the somewhat morbid origins of Valentine's Day, the origins of Galentine's Day, celebrated on February 13, is significantly more light-hearted. The brainstorm of fictional Parks and Rec character, Lesley Knope, Galentine's Day is the day to celebrate the love and appreciation you have for your dearest of girlfriends. And what better way to celebrate your girlfriends than with little tokens of affection? 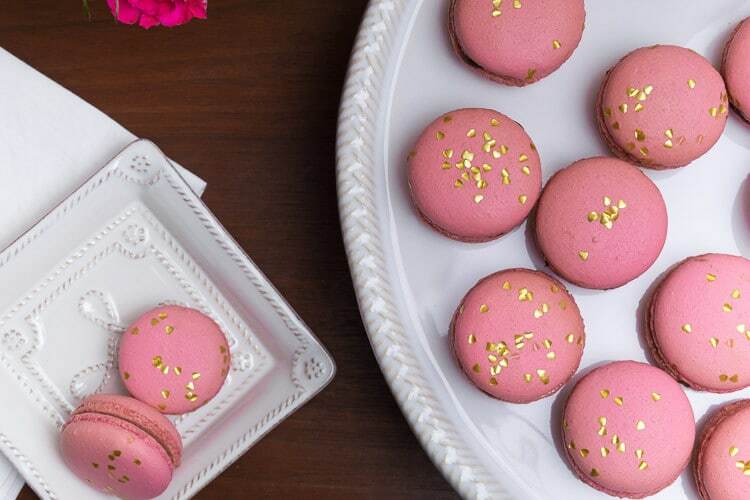 This Raspberry Macarons recipe surely fit the ‘little tokens of affections' bill, if you are looking for ideas. Macarons have earned the reputation of being difficult and persnickety. While true, there are certain ‘Macaron Rules' that you must follow in a successful macarons recipe, those rules are really not difficult. What are some tips for successful French Macarons? Use a kitchen scale and measure all ingredients precisely. And for your powdered sugar and granulated sugar, measure AFTER you've sifted or processed. You can check to see if your finished batter is appropriately mixed by seeing if it ‘ribbons' when held up by the spoonful and is allowed to run off of the spoon. Alternately, you could put a small dollop on a tray and if the peak ‘dissolves' so that the top is slightly convex without any peaks. Make sure all your equipment is clean and dry. Water and grease are not your friends. Let macarons rest for 30-45 minutes before baking…this creates a hardened ‘shell' on the top of the macaron, forcing the air out of the bottom of the shell and creating the much desired ‘feet'. 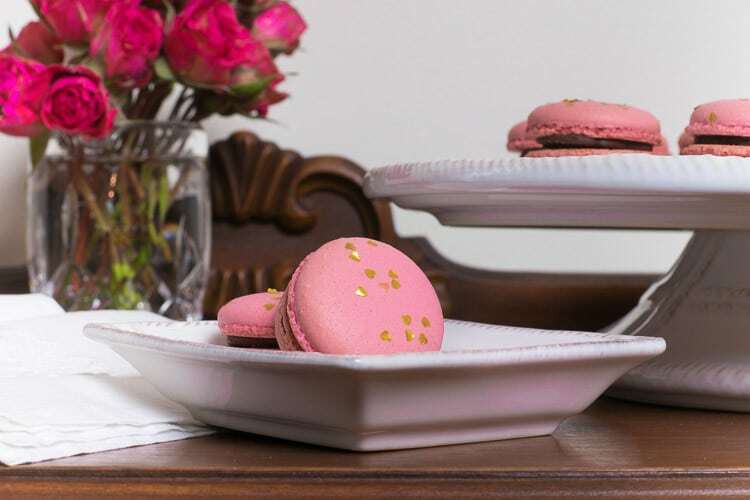 Jot down notes on your macarons recipe when you nail down your perfect oven temperature and baking time. So, what equipment do you need to make French Macarons? No beating around the bush here, any French Macarons recipe is a little equipment intensive. I would consider all of these, with the exception of the mats and the food processor, necessary for successful macarons. Kitchenaid Stand Mixer. This is the one I have and at this writing, it is actually a really good price on Amazon…cheaper than I bought it on sale at Costco! A well-tested and reliable recipe for Macarons. Powdered raspberries are added to the shell for a bright raspberry flavor. Chocolate and Raspberry ganache finish these little treats perfectly. Add almond flour, powdered sugar and raspberry powder to the bowl of a food processor and pulse several times to combine. Do not overmix or almond flour will get sticky. If making powder from freeze-dried raspberries, put them in your blender and process until a fine powder. Sift the powder through a fine sieve, removing the seeds. Measure out 10 grams, reserving the remainder for the ganache and decorating the finished macarons. Fold egg whites into almond flour/powdered sugar/raspberry power blend and fold together with a spatula until paste forms. Do not overmix. Set aside. Beat egg whites and a pinch of cream of tartar on high in a stand mixer just until whites are bubbly, then add caster/fine granulated sugar. Continue to beat egg whites until hard peaks form when you hold the whisk up...approximately 15 minutes. Check after 10 minutes ( if adding food coloring, add now) and then every couple of minutes thereafter until hard peaks form. Gently fold half of the meringue mixture into the batter and then the second half. Continue to fold until mixture resembles a molten lava consistency or it ribbons when you hold the spatula above the bowl. Alternately, add a dollop to a plate, if the peak falls and the macaron is slightly convex, you are ready to go. Carefully pipe similarly sized circle onto a silicone mat or parchment paper. If you do use a silicone mat, to ensure that the mats are clean, dry and not greasy. Hold the piping bag perpendicular to the mat, gently but firmly apply equal pressure and pushing the tip up and down. Let macarons rest for at least 30-456 minutes before baking. Touch the tops of the macarons to ensure that they are dry before putting them in the oven. Preheat your oven to 300°...if you have the convection feature on your oven, definitely use it. Let cool for 10-15 minutes and peel them off of the mat by bending the mat away from the macarons. Remove from heat and add chocolate bits to cream mixture. Let ganache cool to room temperature before piping between macarons. Oh my goodness! These are beautiful Lynn! The video is a great resource too! Thanks friend…coming from you that is a huge compliment!